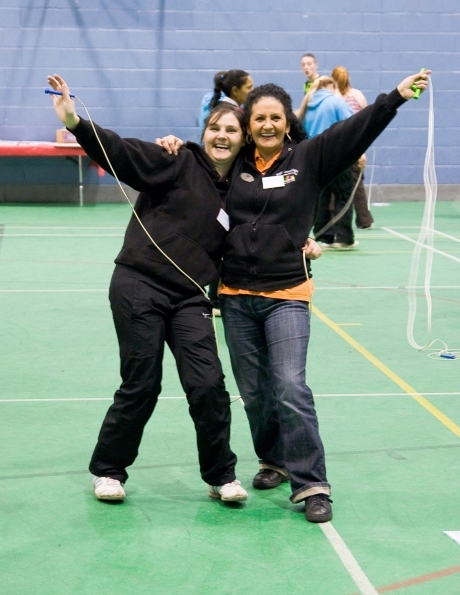 On Thursday 25th February 2010 to celebrate National Heart Month, Birmingham PlayCare Network delivered a Jump Rope for Heart Skipping event. In partnership with the British Heart Foundation and funded by the Big Lottery’s Awards for All programme. BPCN invited over 50 play workers to take part at the NIA. The day was hosted by the award winning Blue and White Rope Skippers. The practical session outlined the health benefits of skipping and different skipping techniques. Childcare workers city wide were given tips on how to transfer the skills they acquired during the session to the children who access their childcare provision. Emma Payne, BPCN’s Business Development Manager commented; “Skipping is fantastic form of exercise and good fun; we are keen for childcare providers to use the new skills they acquire during BPCN’s event to promote healthier lifestyles amongst children”. With physical inactivity doubling the risk of coronary heart disease, the British Heart Foundation is highlighting skipping as an ideal form of exercise for children and a great solution for play providers, schools and families to use as part of the physical activities children participate in. The BHF is trying to address the growing problem of childhood inactivity; they recommend that children and young people aged 5-18 years should participate in physical activity of moderate intensity for at least one hour a day. I am writing this letter to thank BPCN for putting on your course (jump rope) on 25h February. We enjoyed the day enormously, and we thank you for inviting us to attend. We went back and we did skipping with the children. They loved doing the double dutch and every day since a group of them have been doing it on a daily basis. If it was not for the session i really do not think they would have been so enthusiastic – the ropes are brilliant. Thank you from the staff and from the children.